A blend of well matured old cognacs coming from the Fins Bois and Grande Champagne vineyards. It has the same pleasant characteristics as the V.S.V.C. with more maturity and tannin having stayed longer in Limousin oak barrels. The youngest "eaux de vie" of the Larsen range is a blend of matured cognacs coming from various sub-districts from the Fins Bois to the Grande Champagne vineyards. 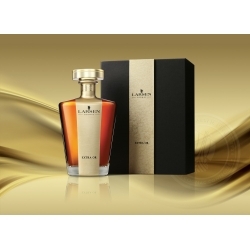 Full bodied flavours of ripe grapes, herbal aromas, smooth, fruity, a fragrant cognac. Elaborated from the best old Grande Champagne and old Fins Bois cognacs with their light dregs. The Grande Champagne gives the ligthness and smoothness and the Fins Bois gives the characteristics of age. The X.O. is round and mellow with a remarkable spicy and fruitcake aroma with some touches of lime tree and ripe fruits. Intense finish and moderate tannin.